Cupcakes & more . . . I hope you didn't think we only made cakes and cheesecakes. That's right. We also offer cupcakes and cake poppers. Cupcakes have always been favorites of ours since we were little kids. These trendy treats are now being showcased at more lavish events such as weddings, taking the place of traditional cakes. They are still favorites at children's parties, birthdays, baby showers and bridal showers, among other events. Whatever the occasion is, these desserts can give you all the pleasures of a traditional cake with their own individual touch. Whether you are trying to satisfy that sudden urge or are planning a special event, our cupcakes will be an excellent solution. They are available in most of the cake flavors that we offer. In addition, we have specialty flavors that are unique to just cupcakes. Reese's peanut butter cup: Rich chocolate cake, with a peanut butter cup baked right in the middle. 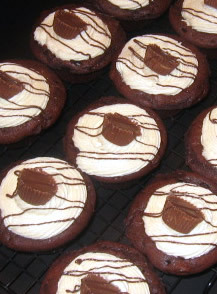 The cupcake is covered with a smooth peanut butter cream cheese icing, topped with a miniature Reese's cup and then drizzled with chocolate. Chocolate Covered Strawberry: Decadent chocolate cake loaded with chocolate chips filled with a strawberry cream cheese icing. The entire top of the cupcake is then dipped in chocolate with another dollop of strawberry cream cheese icing on top. Chopped pecans are then sprinkled on top to complete the masterpiece. What is all the craze about cake poppers? Exactly what are they? 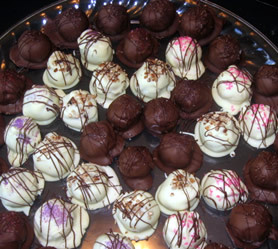 Well, cake poppers are mouth watering decadent balls of cake wrapped in a creamy chocolate. These gourmet delicacies are available in a variety of cake flavors dipped in your choice of dark, milk or white chocolate. Cake poppers can be ordered one cake flavor per dozen; however, feel free to mix and match your choice of chocolate. They can be customized with a variety of sprinkles, nuts or other toppings to coordinate with any event. Cake poppers are a terrific choice for wedding favors, cocktail parties, meetings, or gifts. Their fun size also makes them the perfect cure for your everyday chocolate craving. Don't worry, at $12.00/dozen you can afford to indulge yourself as often as you need.